The long weekend is almost here! If you’re not off on a camping trip or out of town visiting relatives you may well be looking for something to do in Sydney town! 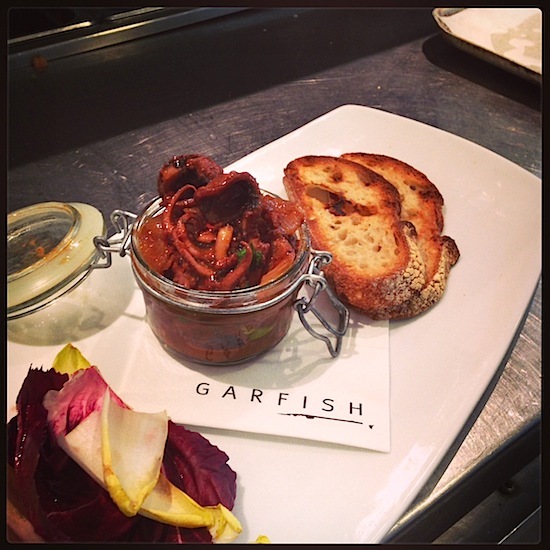 If seafood is on the menu you’ll be happy to know that all three Garfish Restaurants are open over the long weekend. See below for opening times. It’s the last days of our autumn menu, we’ll be switching to our winter menu over the next fortnight. In addition to the standard menu we have some great specials planned for the weekend, pictured here is from Crows Nest: spiced baby octopus w/ radicchio, witlof & crisp sourdough. Don’t forget Vivid Sydney is still on until the 10th (Monday), we’ve had a lot of guests in Kirribilli over the past week that have stopped in for dinner then either walked over the bridge or hopped on the free ferry service to visit the light festival.